On the same day that Tampa Bay Buccaneers’ quarterback Jameis Winston was named to the 2016 Pro Bowl roster, the 2015 first overall pick’s name appeared in a very serious albeit familiar headline, proving he had not yet escaped the shadows of his past. 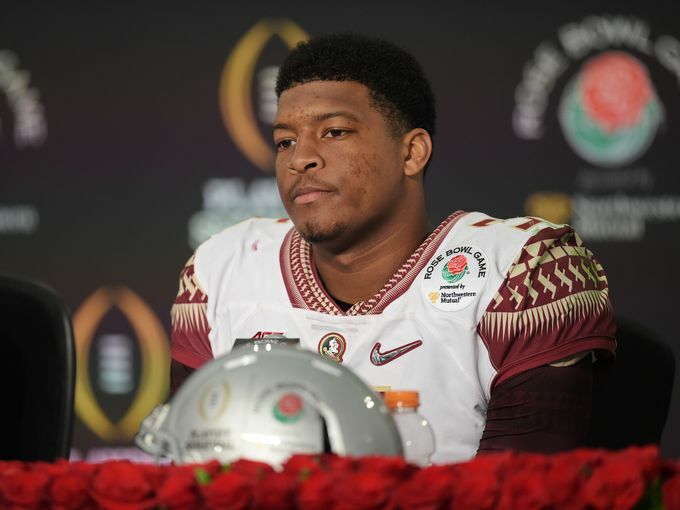 On Monday, January 25, the 2013 Heisman Trophy winner’s alma mater, Florida State University (FSU), reached a staggering $950,000 settlement with Erica Kinsman, a former student who claimed she was raped by Winston in December 2012. Her claims also cited the school fostering a “hostile educational environment” and their refusal to investigate her allegation as Title IX laws dictate. The rest is expected to go to her attorneys. Kinsman, who withdrew from FSU in November 2013 once the case went public, shared her joy and sadness following Monday’s proceedings. “With all the economic demands we face, at some point it doesn’t make sense to continue even though we are convinced we would have prevailed,” he added. In addition to the significant sum, the school also agreed to publish annual reports on their newly installed sexual assault awareness, prevention and training programs over the next five years. Monday’s settlement will not prohibit two other pending legal cases attached to Kinsman’s name. In early 2014, she filed a complaint with the Department of Education’s Office for Civil Rights that opened an investigation into FSU that is still ongoing. Kinsman filed a sexual battery lawsuit against Winston in April 2014. Winston counter-sued for defamation and tortuous interference in May of that same year. Mayanne Downs, one of Winston’s lawyers, issued a statement on Monday, citing her team’s preparedness for the upcoming trial. The U.S. District Court trial, which is set to begin in March 2017, only proves that Winston and his supporters’ attempts to silence Kinsman will once again be unsuccessful.